How much does it cost to build your own Groupon site? My answer is, it depends. If you want to contract the web development out to someone it could cost anywhere between $10k and $30k. But using this recommended Groupon Template it will cost you less than $100. I currently found a new Groupon template to create your Groupon website. 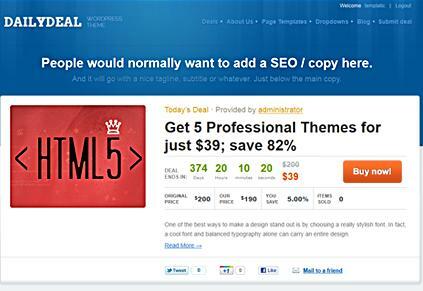 This is a Wordpress theme called ‘Daily Deals’. Check out more details about this theme here. 1. $56/year – Webhosting. I recommend fatcow.com because it’s more affordable than the competition, plus it offers free domain name, unlimited email accounts, unlimited disk space, unlimited SQL databases and more. Fatcow.com is having a 40% off sale, so I don’t know how long the $56/year will last. Check out Fatcow here. 2. 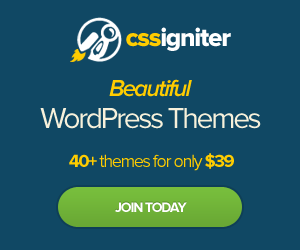 $0 – Install WordPress. WordPressis an open source platform which is totally free. Fatcow.com has fantastico and you can install WordPress easily with clicks of your mouse. Seriously, you don’t need to touch any code. 3. $89.95 Wordpress template. This is a one time fee to purchase the Daily Deals Theme. After download this theme it totally belongs to you. There are no membership fees. 4. -$150 Google adwords credits. Most important part of building up your own daily deals business or coupon site is advertising. If you don’t advertise how will people know about your site? If you get your domain hosting from fatcow.com, they also give you a $150 credit to advertise on Google Adwords, Facebook, Yahoo and Bing – $75 for Google, $50 for Facebook and $25 for Yahoo/Bing. Total cost to create your own Groupon Clone site is (Webhosting + WordPress + Wordpress Theme ) = $145.95. If you include the free advertising credits you get, (Startup costs + Advertising Credits) = -4. This means it will be free to start up a Groupon or Daily Deals website. This is a GENIUS post! Thanks! But what if I want to build a site like Yelp, but WAY smaller and focused on a very narrow vertical. I just need to be able to create a new entry (Name, Address, Specialty, Rating), allow users to comment on and rate the entries, and search/display the entries. Oh and also be able to sell ad space to generate revenue. Can Joomla help me with that? I’m glad you liked the post. I created a post for you on – How to create a review site like Yelp. Question. Do you also need a payment processing partner. Looks like K2 is one that works well with the Joomla template. The Deal Plazza Groupon clone template already comes with a component called VirtueMart. This component is capable of live credit card processing and has pre-defined payment gateways like authorize.net, PayPal, 2Checkout, eWay, Worldpay, PayMate and NoChex. You wouldn’t need to install the K2 component on top of that. If you wanted to create a shopping site with the K2 component, you will have to download the K2 Store component to accept payments. The K2 Store component also has payment gateways including authorize.net. There is a fee to download the K2 Store component, not too sure what it is. You can find more in the Joomla extensions directory. Thanks for visiting my site. Yes! I use another webhosting company for for my other domains and I just checked that they support over 100 countries , Australia included. I use a webhosting called Dreamhost.com. It’s very reliable and easy to use. They have never been down and really fast response time. You can checkout Dreamhost.com here. Hi, I checked out the Deal Plazza Template myselfe and it seemed to me like the most imfortant thing in a “groupon-like” website was missing. With the combination of K2 and Virtuemart the customer can order a product, but the system doesn’t create and mail a coupon-code to the customer. But without a code, the Website is just an ordinary shop-system, right? Just like a Groupon website, users are able to view and purchase deals from your website. I don’t understand when you say you want to mail a coupon code to a customer. After the customer purchases a deal with the K2 and virtuemart component combination they will have the coupon printed or saved on their computer. If you have additional questions, you can contact their support team here. You were very helpful last time in answering my question so I’m hoping you can help me again! After reading your article I purchased a 4 month membership at Template Plaza and put in my credit card details. I then got an unsecured error page and was unable to go back or refresh. I have contacted the website twice about this as my credit card has been charged but my membership is not recognised (can’t log in, no such user). I also want to know if my credit card details are secure given I was redirected to an unsecure page after I put them in. I am am extremely unhappy that no one has bothered to get back to either of my emails (through their contact page) and it’s been well over a week. I am about to request my bank reverse the charge on my credit card. You recommended Template Plazza on your above blog – is this because you’ve used them and found them to be good? Or you run the site or know the people that do? If so can you please pass along that I am a very annoyed customer and will not be speaking highly of them anywhere on the internet, so far my experience has been they’ve taken my money and I have received nothing – not even a reply. Very unprofessional and dodgy. If you have no links to the company you may want to rethink recommending them as you may get their unhappy customers here. Hi, Just an update on the progress of this issue. I have contacted Megan directly and emailed TemplatePlazza about her issue to try to expedite resolving this issue. I hope they provide her with her membership details. I do not work for TemplatePlazza nor do I know anyone who works there. I just saw their template and thought it was a very cool daily deals template. I have noticed that TemplatePlazza support is not the greatest and their response time is longer than 5 days. I have purchased this Groupon template in the past and had no problems, but if you decide to purchase please do so at your own risk. I will keep you updated if we receive a response. If I don’t receive a response from them in the next week I will not promote their template anymore. Yes adrian is right groupon sites create and mail a coupon-code to the customer. So when the customer go to the restaurant for example says the coupon code and waitress verifies it. Is there a plugin that we can generate it on the fly in the process of buying the deal ? 1. Are there any other Joomla templates (or even Drupal) that are more like living social compared to Groupon? 2. Can I add a listing functionality, let’s say a column on the right that has tags of services, so that when clicked, they lead to a list of all companies under that tag, each would have a “contact form” and “read review” button? 3. I’ve been working on Drupal on building the site, which is difficult because you have to manually configure the cart (Ubercart) module to time limit certain offers (emulating living social). I have minimal knowledge in Joomla though. What are your thoughts on the transition? Are there any key elements in the template I should pay special attention to? oops.. sorry I didn’t finish there. I mean, did Adrian try to say that the when purchasing a deal through dealplazza, no unique coupon id is sent? Sorry. I am disappointed with the service from TemplatePlazza and do not recommend you purchase any product from them. If you need additional support for the template you will have to use their support forum here or contact their support team directly. so now that you have changed your thoughts about deal plaza, what would you recommend? how do i get started? Sorry that was a last minute update. I am very disappointed in their service. I don’t have any Groupon template recommendations to provide yet. But if you are interested in creating a coupon/deal site using the CouponPress is a good alternative. The coupon industry is growing and a very hot market as well. For more information about the CouponPress click here. As soon as I find another Groupon template I will post it up for sure. I will do some research and post one up that at least I would use and recommend. I guess it’s not necessary but I thought I would provide you with an update on the situation with Megan, who in earlier posts said she was unable to get any response from TemplatePlazza. Over the past 1.5 weeks I’ve emailed them about 6 to 7 times and didn’t receive any response either. Finally a few days ago they responded to me and contacted her. We finally sorted out the problem. Megan was able to get the template and all is well now. Still I caution you if you want to purchase this template. Purchase at your own risk. Big thanks to Elaine for all her help sorting out my issues with Deal Plazza. Apparently my username and password were sent to me, I just never received it. Also my credit card details should not have been compromised, so that’s good news. All good now, have downloaded the template (yet to have a play with it) and can log into the site just fine. They are definitely a bit slow replying to emails and the English in the replies isn’t that great but all fixed in the end. Still very happy to have found Elaine’s informative blog and links – a great resource! Hi Fernando, if you purchased your web hosting from fatcow.com, you can use the file manager or any FTP software to upload your Groupon template files to your server. I did a search on the fatcow.com website help desk area and found very helpful documentation with pictures and everything. Do a search on their knowledge base for ‘FTP’, the first 3 results will be helpful to you. For Deals Plazza support you will have to contact their template support forum. Hi. When I downloaded Joomla from fatcow.com, it took me to my web address administrator and gave me a username and password. Where do I do the transfers on the fatcow.com or the administrator? Hi, I just wanted to say that TemplatePlazza provided me with exceptional customer service. I am now a Raving Fan! I have little knowledge in this field and they assisted me with the transfer of the template. They were extremely patient with my beginners skills and I highly recommend everyone who is looking for templates to go with them. I’m on the next step now and that is modifying the template and using it, any suggestions? I’m happy to hear that TemplatePlazza was very helpful in transferring your file over to your webhosting. You should use their support forum for members only for any help regarding your Deals Plazza template or any other development support you require to customize your Groupon website. Could you please clarify a few things for me. 1. If I buy the template from TemplatePlazza, how will I be able to manage the deals, subscriptions, coupons, etc? Does Joomla have special plugin for the day of the deal tipe of site? 2. Will I be able to sell downloadable products as an offer of the day? 3. Will I be able to offer affiliate program and reward people for reffering buyers? 4. How will people pay for coupons? If you have specific questions about the Deals Plazza template please use the TemplatePlazza support forum. They will provide you with more in depth answers. DealsPlazza from TemplatePlazza is a Joomla 1.5 template. You cannot install it on WordPress. I wish to install DealsPlazza to my website, however will the download also include the VirtueMart & K2 extensions to my website also? I believe the DealsPlazza includes all extensions needed to create a Groupon website. You will have to confirm with the pre-sales forum to make sure 100%. To get your website to look like the demo, I think you will have to do a little configuration. But again, I’m not the template developers or actually support the template. I would contact TemplatePlazza support team to answer your questions. To bad they don’t tell you, you have to use 1.5 joomla and not the better 1.6 where there are less hackers and Joomla 1.6 is a ton safer. Yes. This is a Joomla 1.5 template. It clearly says that when you view the details of the template. Joomla 1.6 is the latest version but there are lots of bugs that they are still working out. I’m sorry you are having problems with the template. Is there anything I can help you with or contact support to help you with? Question. I need to buy SSL hosting if im using the Deals Plaza? Or it is all in the paypal page? I don’t quite understand your question. The webhosting provider should have SSL, but you need to purchase that separately from your template purchase. I’ve listed some webhosting providers that I would recommend, such as fatcow or dreamhost. What about the sites that offer you a complete platform similar to that of groupon. They are quite more expensive but I believe they have a much better support (base upon the above comments). Has someone used this sites? Hi, do you support Malaysia as well? As a website in malaysia, we have our own gateway for the online transfer , can your website do it? Please contact TemplatePlazza for template related help. If you are interested in purchasing the Deal Plazza template I suggest you read the forum for pre-sales and be aware of what kind of template it is before purchase. If I buy this template it doesnt come with rograing right..this is only the template..which means that I would have to setup the admin page and payments? I would contact the template team for more help. But you are correct, after installation you will need to configure your website and setup your own admin page and payments. Does it support other language and unicode? You can contact Templatic support and ask them this question. They can better answer your question. does this site also work in South Africa? do i get help in doing the website and how much for the help? how long before i can start making money off the site? Templatic offers great support and also has one click installs so you can have your site up and with lots of help. You can ask the Templatic support if it will work in South Africa, but I’m sure if you have all the web hosting and space, it should work there too.